Use Parasetter®, an improved unique foam roller system, daily for just 10 minutes of cognitive breathing exercises into the back ribs to optimize the movement of the diaphragm. These lower back stretches will improve the flexibility of the intercostal muscles, the spine and the deep fascia that is continuous from head to toe. Shallow breathing is replaced by three-dimensional breathing exercises, and the lower back stretches then activates all these organs and muscles so that they become active partners in stress relief. By establishing a direct connection to the brain, the nervous system responds to moderate the adrenals and physiologically assist in lowering blood pressure and reducing cortisol levels. This recovery process deepens with us. The resultant oxygenation from practicing breathing exercises on Parasetter® also improves fascial mobility and increases intradiscal space and decreases tension that results from lying on a flat surface or a conventional foam roller. The result? Back pain from compression is alleviated from these lower back stretches. Fascia mobility allows the bones to resettle to better alignment and enable rehydration. In other words, you feel better, look healthier and slow the aging process. And all you have to do is let go and breathe! Parasetter® supports the ribs in between the shoulder blades, and most importantly, to allow the spinal column to rest inside its center channel. The spinous processes of the vertebral column (those bones in the center of your back) “float” in between the two curved foam roller surfaces, letting the small muscles of the vertebral segment relax and recover their resting length for better blood flow and oxygenation. Parasetter was developed by Clinical Advisor Marika Molnar PT LAc, and the PhysicalMind Institute. Parasetter® is a roller system that supports the body in comfortable supine, kneeling prone and standing positions. 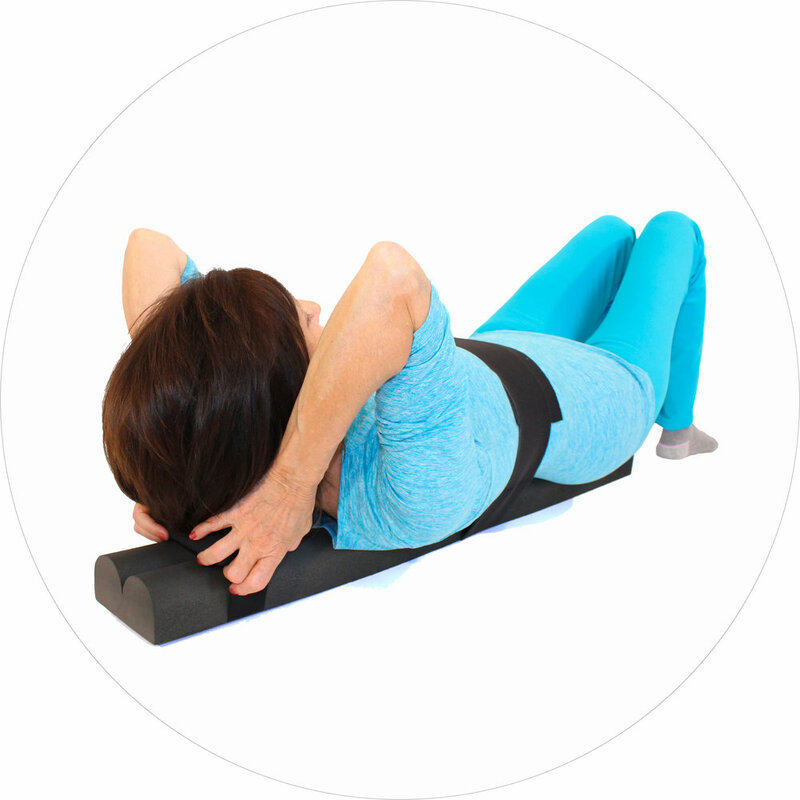 What makes Parasetter® so groundbreaking is its dual convex—or curved— foam roller surfaces that create a cradling effect for the posterior rib cage, the cranium, and the pelvis. Parasetter® comes with two invaluable accessories: The Head Support and Rib Wrap. The Head Support enables a traction-like effect— freeing up space between our 24 ribs resulting in more lengthen in the spine. The Rib Wrap contains the ribs to promote the cognitive breathing exercises needed to help lower blood pressure and reduce cortisol levels. As we all know too well, the stresses of daily life have a compressive loading effect that leads to back pain, decreased height and shallow breathing. The stress is compounded when bodies are overweight or obese. Any excessive physical force from over-zealous exercise or labor makes the situation even worse. These Parasetter® videos explain why this new work is so beneficial. In the Recovery Sequence, see how easily you reset your Parasympathetic Nervous System. Joan Breibart and Marika Molnar PT, LAc discuss the cortisol connection and other benefits. Head Support is positioned for comfort. Close eyes or place a cloth over them. Use Parasetter® on the floor or a firm mattress. With Parasetter® on floor, legs can rest on a chair. Other limb sequences can be used. Ten minutes of breathing is optimal. Rib Wrap should be snug. While focused breathing is necessary for resetting the Parasympathetic Nervous System, it’s actually the exhalation that is key. It’s essential to exhale for a few counts longer than your inhale because the vagus nerve – which runs from the neck down through the diaphragm – sends a signal to your brain to activate the PNS and reduce the activity of the Sympathetic Nervous System. As we already know, the SNS is responsible for cortisol and the fight-or-flight response; by performing this focused breathing with a longer exhale, the body is able to return to a calmer state much more efficiently and effectively. Parasetter® is a Registered Trademark # 4,814,400. Parasetter® is a patented product US9,801,779B2. It was invented in New York and is manufactured in California, Maryland, and Pennsylvania. Parasetter® is 100% MADE in the USA.